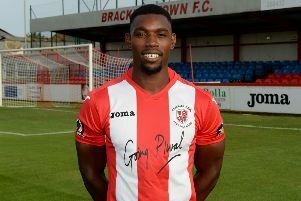 Brackley Town got their first Vanarama National League North success in seven outings with a 3-1 victory over Blyth Spartans on Saturday. Aaron Williams struck twice as Saints overturned a halftime deficit with two goals early in the second half and a late penalty to move into fourth place behind Spartans in third in a wind-blown game that was nevertheless of high quality. Saints could have taken an early lead but Peter Jameson made a good save from Andy Brown before Daniel Maguire fired the visitors ahead in the 18th minute with a fine strike from a half chance. Spartans’ left back Ian Watson saw his 25 yard effort fly just wide while at the other end Brown was denied only by a saving tackle from Nathan Buddle. The second half though saw a complete turnabout as Aaron Williams equalised a minute after the restart, a rumbustious effort winning the ball and lashing his shot past Jameson to find the net for the sixth game in a row. Shane Byrne then put his side in front in the 51st minute, tucking his shot inside the post after strong work by Brown. Two Blyth players were shown yellow cards for some curious argy-bargy with each other as the game became tetchy and Spartans struggled to break out in the teeth of high winds. Saints wrapped it up in the 85th minute when Williams was brought down needlessly conceding a penalty which the striker converted into the bottom corner of the net.